…with additional items from our fellow Urban Edge farms: Scratch Farm, Zephyr Farm, and Pak Express Farm. 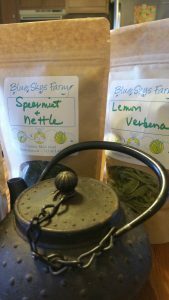 This week’s herbal tea sample is Spearmint and Ashwagandha. Come visit us Saturday at the Pawtucket Wintertime Farmers Market. Our sample this week is Spearmint and Ashwagandha.